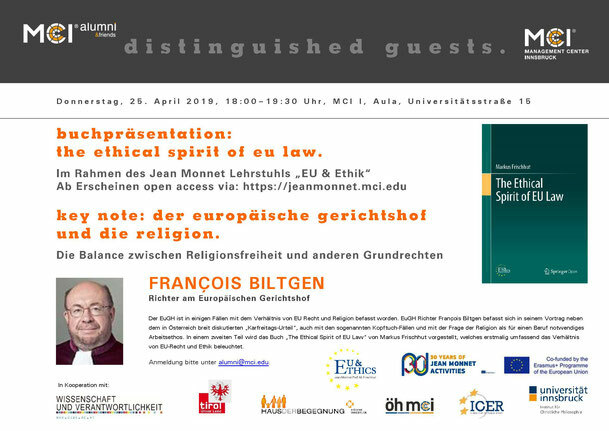 Veranstaltungshinweis: Buchpräsentation "The Ethical Spirit of EU Law"
European politics has a significant impact on Austrian policy-making. And conversely, Austria's policy is the constitutive element of what is being negotiated and decided "in Brussels". This volume explores the question of how, under what external and internal conditions, Austrian ideas, strategies and interests towards the multilevel system of the European Union are conceived, coordinated and articulated. Which national coordination requirements and strategies generate and impact on Austrian positions? How do feedback mechanisms work to secure democratic and transparent decision-making chains? How do the political system of Austria and the supranational EU system influence each other? For the first time, this volume offers a comprehensive analysis of all actors, institutions and processes involved in the Austrian EU policy-making machinery, as well as the most important policy areas for Austria. The volume is aimed at students, teachers and researchers of the EU integration studies, at employees of the Austrian European policy in parliament, government, administration and interest groups as well as at scholars interested in the comparison of the coordination of European politics. With contributions by Katrin Auel, Susanne Bachmann, Erhard Busek, Peter Bußjäger, Doris Dialer, Annegret Eppler, Klemens Fischer, Franz Fischler, Anna Gamper, Josef Glavanovits, Andreas Hackhofer, Elisabeth Kornfeind, David Liebich, Andreas Maurer, Nikolaus Morawitz, Andreas Th Müller, Heinrich Neisser, Christa Peutl, Georg Pfeifer, Melanie M. Plangger, Maria-Elisabeth Pösel, Johannes Pollak, Andreas Rosner, Fritz Staudigl, Regina Tschann, und Markus Wagner. We congratulate our colleague Melanie on her award!